Whenever I evaluate a new storage hardware or technology, I do some basic performance testing with VMware I/O Analyzer. I/O Analyzer is virtual appliance (Fling) provided by VMware that runs Iometer to generate synthetic I/O workloads. After installing PernixData FVP my first idea was to compare the raw performance of my storage, against the performance with PernixData FVP. However, I quickly noticed that synthetic workloads do not create any useful results. The upside is that I've learned much about how their caching operates so I'm publishing my results anyway. Actually, it's not a problem with PernixData FVP itself, it's just how host based caching works. Conclusion: Don't use synthetic workloads to test caching solutions! 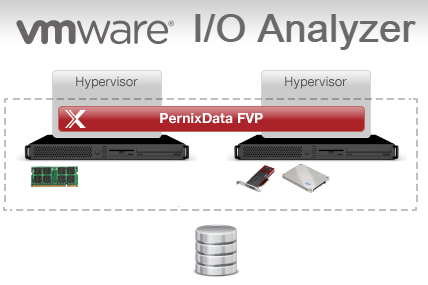 PernixData FVP works as expected but synthetic I/O workloads are no meaningful benchmarks for host based caching. I am going to test with realworld applications in another article to show how they can take advantage of FVP.